CAFFs work has subsequently been informed by the strategies and the recommendations generated through these documents, and they will be used to consider the manner in which CAFF has fulfilled its mandate. The Arctic Biodiversity Assessment (ABA): Report for Policy Makers makes nine key findings and 17 policy relevant recommendations. The recommendations are aimed primarily at the Arctic Council, its member states and Permanent Participants. Success in conserving Arctic biodiversity, however, also depends upon actions by non-Arctic states, regional and local authorities, industry and all who live, work and travel in the Arctic. These recommendations may, therefore, also provide a guide for action for states, authorities, and organizations beyond the Arctic Council. Some of the ABA recommendations directly encourage cooperation with those outside the Arctic Council process. 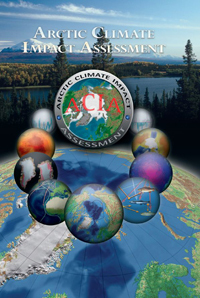 In 2004, the Arctic Council and the the International Arctic Science Committee released the Impacts of a Warming Arctic synthesis report and later in 2005, the full Arctic Climate Impact Assessment (ACIA) report. The ACIA has proved an important and influential assessment and provided direction for a wide variety of Arctic Council activities. The ACIA report highlighted the lack of knowledge about the Arctic's ecosystems. It called for a range of recommendations to increase understanding of the Arctic environment and have provided important guidance for CAFF activities. In its acceptance of ACIAR17;s recommendations, the Arctic Council directed CAFF to further examine the findings related to biodiversity conservation and to develop follow-up programmes and activities that would address key projections for the future of the Arctic. CAFF's primary response has been the development and the implementation of the Circumpolar Biodiversity Monitoring Program (CBMP) and the Arctic Biodiversity Assessment (ABA). It is anticipated that these activities will further guide future CAFF work. 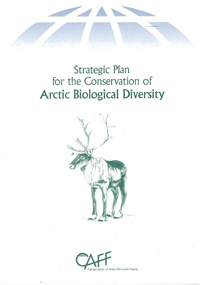 The Arctic Flora and Fauna Recommendations for Conservation (2002) contains a series of thematic goals and recommendations arising from CAFF's Arctic Flora and Fauna: Status and Conservation (2001) report, a science-based overview of Arctic biodiversity and key conservation issues. Although the Strategic Plan for the Conservation of Arctic Biological Diversity was intended to provide overall direction to CAFF only until 2001, it continues to inform CAFF's work through established principles and identified actions to fulfill the five priority objectives. 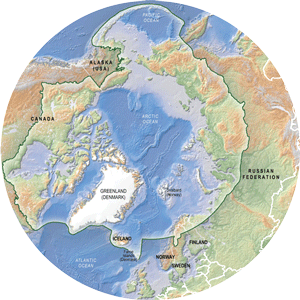 In recognition of the fact that the objectives of CAFF and the CBD are complementary to each other and that most of CAFF's projects directly address conservation and sustainable use of biological diversity, the Arctic Council tasked CAFF to develop an Arctic strategy relating to the goals of the CBD. The outcome of this work is the Cooperative Strategy for the Conservation of Biological Diversity in the Arctic Region. In addition to providing strategic direction relating to the goals of the CBD, it is part of the overall conservation framework for CAFF. promote the participation of local and Indigenous peoples in the development and implementation of policies and programs relating to the conservation of Arctic biological diversity and the sustainable use of biological resources. The Cooperative Strategy for the Conservation of Biological Diversity in the Arctic Region, called for enhanced monitoring and marked a significant starting point for CAFF's monitoring work. 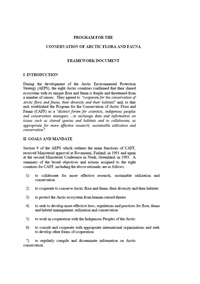 CAFF's Framework document, the Program for the Conservation of Arctic Flora and Fauna Framework Document, approved by Ministers in 1991, was a response to the lack of circumpolar information about Arctic biodiversity, and coincides with the environmental awakening occurring in global politics during the late 80s and early 90s with the Rio Declaration and Agenda 21, the World Charter for Nature and the growing rise in awareness of sustainable development in the context of global politics.